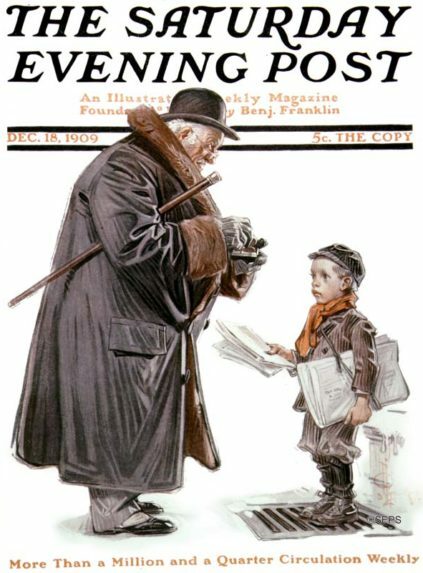 While those familiar with The Saturday Evening Post often think of Norman Rockwell as its most prominent illustrator, his mentor, Joseph Christian Leyendecker, made the Post an iconic magazine. 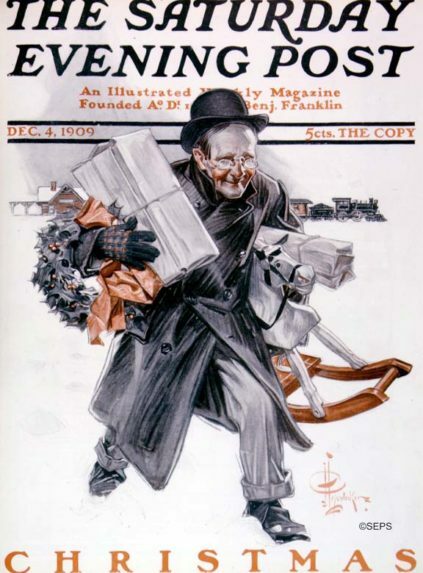 Through his illustrious career as a popular cover artist, The Post rang in the early twentieth century with dozens of J.C. Leyendecker’s babies, advertisements, and holiday illustrations. Born to Peter and Elizabeth Leyendecker in Montabaur, Germany on March 23rd, 1874, “J.C.” Leyendecker emigrated from Germany to Chicago, Illinois with his family in 1882 at the age of 8. His close relationships with his two brothers, Francis Xavier and Adolph, along with sister Mary Augusta, would later impact the adorable infant and adolescent depictions of his most famous illustrations. Having a natural talent for art, Leyendecker and his brother, Frank, studied and worked together on small projects wherever they could find them. At the age of 15, Leyendecker apprenticed with J. Manz & Co. Engraving in Chicago. He learned quickly, rising to a job as Associate Illustrator under his Chicago Art Institute instructor, John Henry Vanderpool. Vanderpool had studied, researched, and even published a book on human anatomy, passing on to Leyendecker much of what artistic anatomical knowledge was available at the time. By age 19, Manz & Co. had given Leyendecker a solo contract to illustrate sixty images for a client’s private bible, demonstrating utmost faith in his artistic abilities. In early 1896, the artist won a magazine cover competition for Century Magazine, which elevated his artistic brand to national fame. By autumn, J.C. and his brother Frank had enrolled at the Académie Julian in Paris, France. J.C. Leyendecker quickly rose to prominence while in Europe, earning a spot in a major painting exhibition at The Salon Champs de Mars in 1897. The brothers returned to Chicago in 1898 and together opened a studio for two years before moving their firm to New York City in 1900. Over the course of his artistic career, Leyendecker completed 322 illustrations for The Saturday Evening Post and countless others for magazines such as The American Weekly, Success, and Collier’s. Not only did the artist work for magazines, he also created some of the most successful advertising campaigns in American history. His ingenuity led to serial popularity, whether by the continuation of his New Year’s Baby theme for The Post as started in the magazine’s December 29th, 1906 edition, or his invention of the debonair Arrow Collar Man while working for Cluett, Peabody & Co. in 1905. His work for Arrow Collar single-handedly increased the company’s sales to $32 million a year, making it the nation’s most successful men’s clothing company. Leyendecker’s strong models defined manhood for an entire generation. His artistic reach knew no bounds. His famed illustrative depictions range from calendar holidays to collectable artwork of cherubim babies, relatable American life, and sports and war heroes. In some ways, Leyendecker happened to be a trained artist in the right place, at the right time. His work brought him financial success and international notoriety during the golden age of American illustration. In 1914, he built a home in New Rochelle, New York where he lived with his brother Frank, sister Mary, and the original Arrow Collar model Charles A. Beach. Beach lived in the house as Leyendecker’s live-in secretary, business manager, and partner. 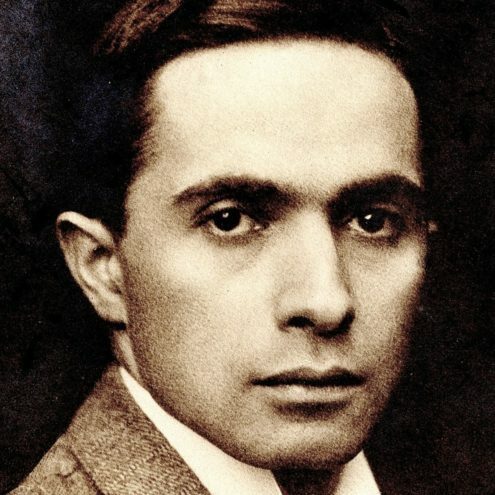 J.C.’s brother Frank eventually moved out of the house in the early 1920s (possibly due to jealousy over his brother’s fame) and died of an overdose in 1924. 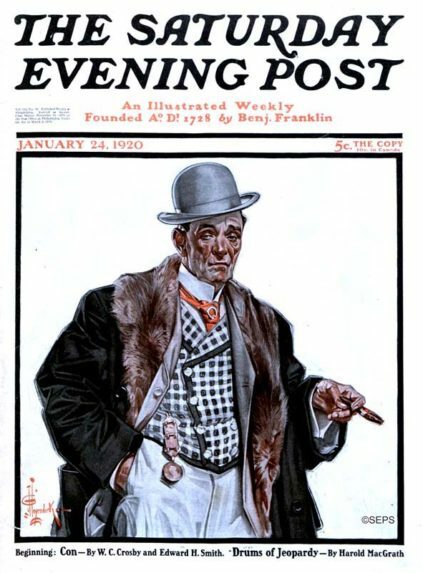 Leyendecker’s popularity and financial success not only survived, but thrived during The Great Depression and World War II era. By 1945, editorial changes at The Saturday Evening Post cut his once unbreakable relationship with the magazine. He had spent much of his earned income and returned to shopping his illustrations during the pre-eminent rise of photography. Leyendecker lived a solitary life, keeping his family and friends close. He was never a recluse, yet shied away from public engagement. His home in New Rochelle was once known for boisterous and enjoyable parties. The grounds contained a large garden complex complete with roaming chickens and ducks where artists could trade ideas and discuss technique. J.C. Leyendecker outlived many of his friends and, by the time he died of a heart attack in 1951, had only five individuals attend his funeral. Norman Rockwell and three of Leyendecker’s favorite male models acted as pallbearers. Leyendecker had faced some financial struggles toward the end of his life when the popularity of periodicals and illustrated covers declined. He still managed to leave a sizeable inheritance of $60,400 to his sister and 49 year live-in partner, Charles Beach. They, now famously, sold many of his life’s works in a yard sale in the gardens of the New Rochelle house for as little as $75 a piece.